That’s right – Shopbop’s BIG EVENT started yesterday, so of course I already scooped up the pieces I’ve been lusting after. In addition to the sale I also had a gift card to spend, so I went a little crazy! I picked up this gorgeous BCBG dress that was from their fall runway – I’ve been obsessed since I saw it on the catwalk back in February. The colors are just too divine for fall but make it a perfect transitional piece into spring as well. Adorable PJ’s and a colorful scarf were also on my list for winter, but I’m also super excited about the two pieces I picked up for resort. This flirty DVF dress is going to be beautiful day or night – I just adore the color! Also, I’ve been eyeing Jenni Kayne’s popular D’orsay flats for a while and I finally got my hands on a coral suede pair for spring (also loving the seafoam green pair)! CLICK HERE to start shopping now and save up to 35% on your purchase when you enter code BIGEVENT12 at checkout! 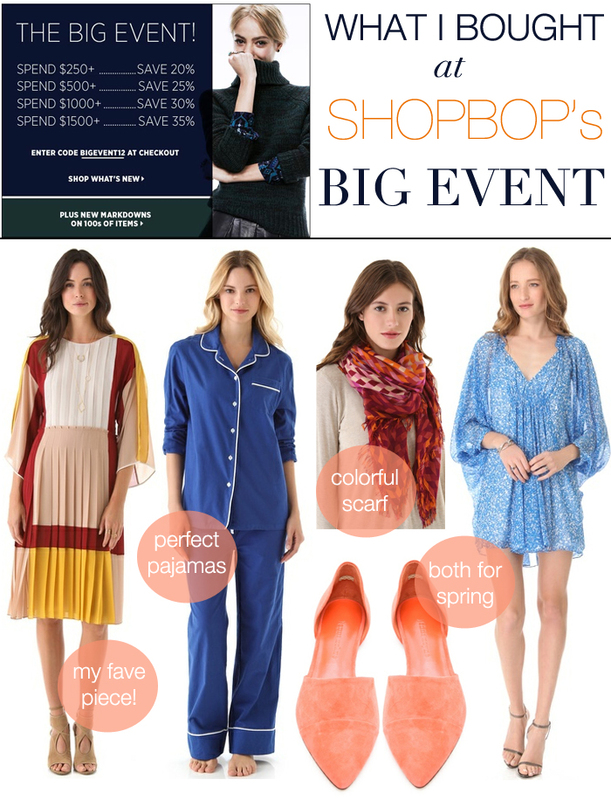 PS – click here to check out the latest Shopbop Holiday Gift Boutique! I love that you got those JK flats, I’ve been wanting to snag some too! I might have to for spring!